This is one of the bigger banks at the east coast and you will find plenty of ATMs in State College, Philadelphia, New York etc. There are three versions of the PNC Checking Account: PNC Virtual Wallet, PNC Virtual Wallet with Performance Spend and PNC Virtual Wallet with Performance Select. Depending on your income (or your average balance) you might be eligable to get the second or third one free of charge. They give higher interest rates in your saving account (up to 0.8%) and with Performance Select you can withdraw money from any ATM free of charge (you get reimbursed for any costs another bank may charge you). IMPORTANT: Sometimes there are great offers that allow you to get 100-300 USD for just signing up. Make sure you google beforehand to see if you are eligable for such a deal, for instance this one. This is the local Credit Union for PennState members which means there are not so many ATMs and you may have to pay some fees if you take out money at ATMs of other banks. However, PSFCU does offer some very generous options for loans (if you need them at some point) and for their credit card (you will usually get a credit limit of 3000 USD as graduate student which is six times as much as you get at PNC). The higher credit limit for your credit card is in particular useful to build up your credit history. Another good bank for students is Ally bank. It is an online bank, meaning all interactions with the bank are done online or via phone support. They do not charge any fees regardless of your balance or income. Moreover, all ATM withdrawals within the United States are free, which means that even ATM fees (charged by the ATM) are reimbursed. Finally, Ally bank offers a comparably good interest rate (0.9%) for its saving accounts. Ally bank does only provide a debit Master Card, but no credit cards. For some international student the banking system of the United States might seem like coming from the previous century: people pay bills by actually sending real checks and in order to use a credit card it is often enough to know the full number printed on it (for online purchases, one often needs an additional 3-digit number printed on its back). However, most banks offer online banking within the US comparable to the European bank system. Don’t do wire transfers: Electronic wire transfers are often made by calling the bank or directly at the counter. They are usually rediciously overpriced (10-20 USD) and only relict (possibly only to make money from customers that are not aware of cheaper and more convenient options). PNC bank offers pop money: If you have a PNC Virtual Wallet (or a similar PNC bank account), you should have online access to a system called pop money that allows free money transfers of up to a certain amount at the time (500-1000 USD). You only need the account and routing number of the person, you are sending money to. PSFCU offers online bill pay: Even if the online management might look like as if it came right from the beginning of the internet, you can easily transfer money online. You only need the account and routing number of the person, you are sending money to. With Google Wallet you can attack money to your emails: A very modern approach to transferring funds is offered by Google Wallet. It is a free service for which you can apply as soon as you received your social security number. You will receive a free Google Wallet Master Debit Card that you can use to pay anywhere in the US using the funds from your Google Wallet account that can be connected to any of your bank accounts. Moreover, you can instanteneously send money to other Gmail users via emai. If you are an international student, you might want to transfer some of your earnings back to your home country. However, this is often connected to high costs because you will need to pay both transaction fees and currency exchange fees. Even if it looks like that you are not charged any fees, almost every bank will still use a currency exchange rate that is lower (by 1-5%) than the official interbank rate (the exchange rate that international banks use as they transfer funds). If you have a credit card which does not charge additional exchange fees (such as the VISA Debit card of PSFCU), you can use it to withdraw money from an ATM in your home country when you are visiting. In theory, you could even open an additional account and send the credit card to your parents or friends, so that they can take out funds whenever you want to transfer money there. In general the conversion rate used by credit cards are very good (unless you have additional fees/percentages taken by your bank). However, the credit card company (VISA or MasterCard) usually charges 1-1.5% from the interbank rate. This is almost the best you can get. If you want to transfer large amounts, you can check with the bank in your home country if they accept international checks in foreign currencies and if they will use the official interbank rate to cash it. There are a few banks that do this and those are the rare occasions when it might be better to pay a 20 USD fee to get an international check from your American bank. For instance, if you transfer 5000 USD, 20 USD correspond to only 0.4% that you will pay. However, make sure that the bank in your home country really uses the official bank rate, because otherwise you may pay an additional 1-5% to your bank due to a disadvantageous exchange rate. There are online services, such as transferwise.com or currencyfair.com that only charge approximately 0.3-1% of your funds. Usually, CurrencyFair offers the best rates at its MarketPlace. You can read more about Currency Exchange here. If you want to get a loan in the United States or sometimes even if you just want to open a bank account, the bank will check your credit history. There are three rating agencies that collect relevant information and thus it is often a good idea to start building a credit history as early as possible. After opening a bank account at PNC and/or PSFCU, you can ask if you can get a credit card. You might have to wait for a few months until you are eligible, but once you are it is a good idea to get a credit card, possibly even from both instiutions. It may sound crazy, but it is really a good idea to get those credit cards, even if you are not planning to use the credit card at all to get credits. If you have credit cards and always pay your credit bills (even if there is nothing to pay because you don’t take a credit), your credit rating will go up. On this website you can learn more on how to build a good credit rating. Furthermore, you can find step-by-step instructions on this website that are helpful to start with. A good credit rating is important to get certain credit-like store cards, for instance for Macy’s with a good price reduction. A good credit rating allows you to get credit cards with bonuses and cash backs, for instance Chase offers up to 5% cash back on eligable purchases. Some of these bonus cards even let you collect bonus miles of certain airlines in order to travel much cheaper around the world. It is rather messy to really get into the details, but there are people who gain free transatlantic flights by applying for the right cards and collecting the right bonuses. More on this can be learned from websites like flyertalk.com. Usually this form needs to be filed by EVERY international student (mainly F-1) regardless if they have income or not. The main purpose is to exempt you from the “substantial presence test”. The substantial presence test determines if you count as resident or non-resident for tax purposes. Roughly speaking a normal person would count as resident for tax purposes if he or she was at least 183 days present in the US during the tax year. However, international students are not normal people and can/should/must use form 8843 to get an exemption from the substantial presence test for 5 years. That’s because international students fall in the category of “exempt individuals” of form 8843. But what’s the difference between resident and non-resident for tax purposes? The main difference is probably that as resident you need to pay taxes on your world-wide income. In particular this means that if you have capital gains (stocks, funds etc.) on a bank account in your home country, you will need to pay US tax on the earned interest, unless there are some special treaties with your home country. A big catch is that your brokerage bank need to provide you with tax forms for the American IRS if you count as resident for tax purposes which means a lot of nonadministrative hassle for bank. There are many smaller, but also bigger banks worldwide that will just stop doing business with you. However, that does usually not affect checking accounts, but it may affect savings & brokerage accounts. The other aspect is that if you have capital gains in the US, you will be taxed with a fixed rate of 30% unless there is some tax treaty with your home country, for instance Germans don’t need to pay any US tax on capital gains in the US (but of course they need to pay German tax on it). Either way, it is usually said that international students must file 8843, either because most students prefer to stay non-residents for tax purposes or because their home country demands it. In most countries you will theoretically need to pay tax on your worldwide income, including your US graduate student wage, but also most countries have some type of treaty that allows you to get around it. For details on this you should check with a tax preparer of your home country or just Google long enough. Either way, make sure that you file form 8843! This is the standard simplified (EZ = easy) form that you will need to file as international graduate student (NR is for non-resident). You can find the instructions here, they are very complete (but you don’t need to read everything). However, if you have capital gains in the US, you might need to file another form. The following paragraph illustrates the standard rules to fill in this form in 2014. It should be fairly general, but of course it can happen that there is something that doesn’t apply to you. It’s all on your risk, but should be correct for most graduate students. As PennState graduate student you will receive a W-2 form indicating how much you earned in the past tax year and how much tax was automatically deducted by the university. There was tax deduction for Local tax (cell 19), State tax (cell cell 17) and for Federal tax (cell 2) that should appear in the appropriate cells of your W-2 form. Moreover, there is your taxable gross income (cell 1). If you are an international student from a country with a tax treaty, you might actually able to subtract a few thousand dollars from this amount. The following website or here or here shows a list of countries, their tax exemption amounts and for how many years this exemption can be claimed. If your country is among them, it’s probably a good idea to check with additional sources and maybe even by reading the official tax treaty document – just to make sure. For instance, if you are from Belgium you can claim an exemption of 9000 USD for 5 years. Either way, if you happen to be lucky to get such an exemption you will need to write the exempt amount on line 6 of form 1040NR-EZ. Moreover, you directly subtract this amount from the taxable gross income on your W-2 (cell 1) and put it on line 3 of form 1040NR-EZ (unless you have some other income that you need to add, but you can basically subtract the exempt amount from your total taxable income). If you used such a tax exemption, you need to quote the exact tax paragraph of your country’s tax treaty at the end of the second page of form 1041NR-EZ. The exact paragraphs are quoted on the website linked above and you can read the tax treaty yourself to make sure. If you received a scholarship/fellowship you might have paid tax on it and received a 1042-S form. However, many countries don’t tax scholarships/fellowships and have tax treaties. For instance, if you are from Germany, you don’t need to pay any taxes on scholarships/fellowships you receive in the US during your first fours years. Check this table for more information – again make sure you check yourself additional resources. Usually, you can let PennState know in advance that you are tax-exempt from scholarships and they won’t withhold any money from your scholarships/fellowships (otherwise you will usually see tax deductions in your semester bill under elion because most scholarships/fellowships are handled through the Bursar’s office and not payroll). If there were tax deductions, you can reclaim them by putting the withheld income into line 18b of 1040NR-EZ and mention the scholarship/fellowship as excluded in line 8. Your taxable income will also be lowered by the amount you already paid for local and state tax. For this, you need to add the amounts withheld from your W-2 form, more precisely you need to add the amount from cell 17 and 19 in your W-2 form and put into line 11 of form 1040NR-EZ. If you read the instructions carefully, you will see that there is some complicated procedure to figure out if you can subtract ALL your state and local tax, but for students with our income of only a few ten thousand dollars, there shouldn’t be any problem deducting the full amount of local/state taxes. You might even be able to add the LST tax mentioned on your W-2 (cell without number), but the amount should be so small that it doesn’t really matter anyway. Finally, the first 3950 USD (in 2014, probably even more in future years) of your taxable income is tax free (unless you make several hundred thousand dollars. Therefore, you can put the current amount (3950 USD in 2014) into line 13 of form 1040NR-EZ. There might be situation where you can deduct more than 3950 USD because you file for yourself and a spouse. You should check this in detail if this applies to you. At this stage your original taxable gross income from your W-2 form should be reduced by (a) the exemption amount of your country’s tax treaty, (b) the withheld money for local & state tax and (c) the standard deduction of 3950 USD (for 2014). This can save you up to a few thousand dollars of taxes that you might have paid without needing it. The reduced amount should now appear in line 14 of 1040NR-EZ. You can now use the tax table provided in the instructions of form 1040NR-EZ and lookup your total tax based on your total taxable income in line 14. The resulting amount you will need to put into line 15, 16 and 18 (because they shouldn’t differ unless you needed to pay Medicare tax and received additional forms). You can now compare this amount of tax that you need to pay with the amount that was withheld from you. For this, fill in line 18a and 18b (it only applies if there was tax withheld form your scholarships/fellowships shown on your 1042-S). If the sum of 18a and 18b appearing in 21 is greater than your total tax from line 18, you will get tax back. Don’t forget: If you had other US income sources as a non-resident for tax purposes, you need to include all this money. In particular, if you had capital gains (stocks, funds etc in an American brokerage account), you CANNOT use 1041NR-EZ, but need to use the longer version. If you still find it too complicated, the Global Office will help you. Read more in the next chapter. Last comment for scholarship/fellowship holders who don’t need to teach (full scholarship holders). There are some weird rules regarding the question if you need to pay federal taxes on them or not. In most cases, it is best to trust the W-2 form that you can access through ESSIC. If it tells you under Payroll (upper right corner) –> Earning statements (left) –> Select your tax year that there your taxable gross income is zero, you probably won’t need to pay tax on this scholarship/fellowship. In this case, you also won’t receive a W-2 form. If this means that you don’t need to pay any tax and there was also no tax deducted from your account (for instance because you also received a scholarship through the Bursar’s office where tax was withheld that you might partially of fully get back), you DON’T need to file form 1040NR-EZ, but just form 8843 explained above. State tax is significantly less work. Instead of filing with paper forms, you should be able to do it online. In most cases, it is just the easiest to use the website from padirectfile (at least for tax 2014) from the Pennsylvania Department of Revenue as long none of these points apply to you. In general, international graduate students should be able to use it without any problems. Most things should be self-explanatory. Usually, there is not much you can gain and the amount deducted through the university should agree with what you need to pay – unless some cool tax moves apply to your situation. Another quick comment on full scholarship holders: Usually, you don’t need to work for your scholarship and thus also don’t need to pay any state taxes on such scholarships. This is due to the following Pennsylvania regulation. In most cases, it is best to trust the W-2 form that you can access through ESSIC. If it tells you under Payroll (upper right corner) –> Earning statements (left) –> Select your tax year that there your taxable gross income is zero, you probably won’t need to pay tax on this scholarship/fellowship. In this case, you also won’t receive a W-2 form. In this case, you probably even don’t need to file any state tax because you only need to file in Pennsylania if your taxable income is at least 33 USD. Usually you will receive a tax form in the mail. This tax form will contain a few digit code that allows you to file your taxes online. That is great and should save you some work. Residents pay a few percent, while non-residents pay a flat tax of 1% which should be fairly low. Sadly, there are only vague definitions of a non-resident, but they basically state that everybody who doesn’t intend to stay in State College forever (meaning a long time, as your home) count as non-resident. Thus international students should only pay 1%. If ESSIC tells you under Payroll (upper right corner) –> Earning statements (left) –> Select your tax year that you paid more than 1% as international students, you should check exactly what applies to you. A final comment on full scholarship holders: Usually, you don’t need to file any local taxes and also won’t receive a letter by the local borough. Again, check through ESSIC if you had taxable income. If not, you also don’t need to pay local taxes. They buy an online software for international students that helps to prepare the needed documents. In general, you can always fill in the documents yourself because it is certainly not more complicated than a scalar quantum field theory – but the software helps to save time. After you used the software and came to the conclusion that your situation is more complex than what the software offers, that is maybe on the difficulty level of a non-abelian gauge theory, you can book sessions with a professional tax advisor who volunteers to help PennState international students. They are usually very competent and it is free of charge. This tutorial presents a solution for the following questions: How can I automatically transfer the grades from a prepared excel sheet (for my own records) into the webform of Angel (which sadly does not provide an import function). You need to prepare an excel sheet (or another spreadsheet) and save it *.csv file using the Save as option. Usually, it is a good idea to work mainly with the *.xlsx file that supports formulae and only save a copy as *.csv that you use to import the grades. When you update the *.xlsx file you can just overwrite the *.csv with the new version for importing new grades. In order to prepare your Excel sheet, please download this example Excel sheet. 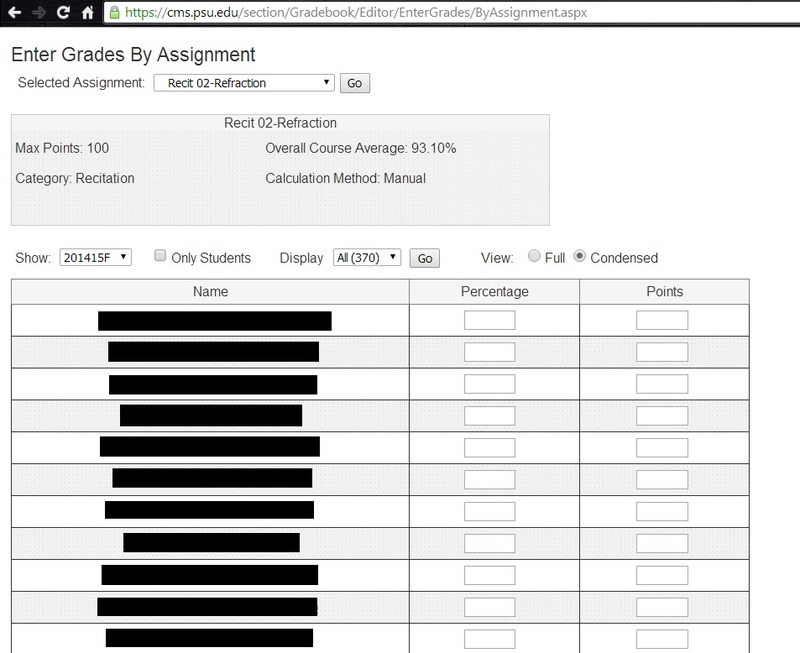 Feel free to adjust it, but make sure that the field in the first column and in the row of the first student (usually the second row) contains”datalistUsersGrades_ctl02_txtPercentage” (notice the 2). This number should then count upwards for the subsequent rows. 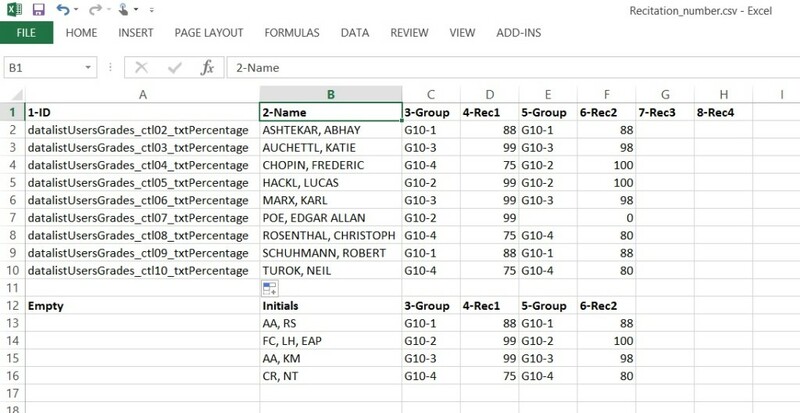 The example Excel sheet contains a function that should automatically generate the correct names when you extend it. The expression refers to the ID of the HTML field in Angel which we want to fill with the student information. My macro is based on the browser plugin iMacros. This plugin is freely available for Chrome and Firefox. You need to install it before you can proceed. (Only for Chrome) Moreover, you need an additional feature of iMacros that allows you to access your *.csv file from your computer. This website lists the links that you need to add file access for Chrome. If you are using iMacros for Firefox you don’t need to do anything because file access is already integrated in the main plugin. Download the following file and copy into the folder you just specified. This is the macro I wrote whose source code is extremely simple and a slightly adjusted version of an online available resource (just as a reference). After you copied the file name Filling form.iim should appear in the main window of iMacros, just as it does in the picture. If it doesn’t appear, you might need to restart your browser and iMacros. Change the filename (red in above source code) to the filename of your *.csv file whose grades you want to copy. Change the Y (blue in above source code) to the column containing the grades that you want to copy. Now open Angel in your browser and go to the course you would like to enter the grades for. Click on Manage and then on Gradebook. Usually, you will want to enter By Assignment, for which you need to click right on it and select Open in new window. This is very important in order to give access to iMacros (otherwise the gradebook will only appear in a html frame). 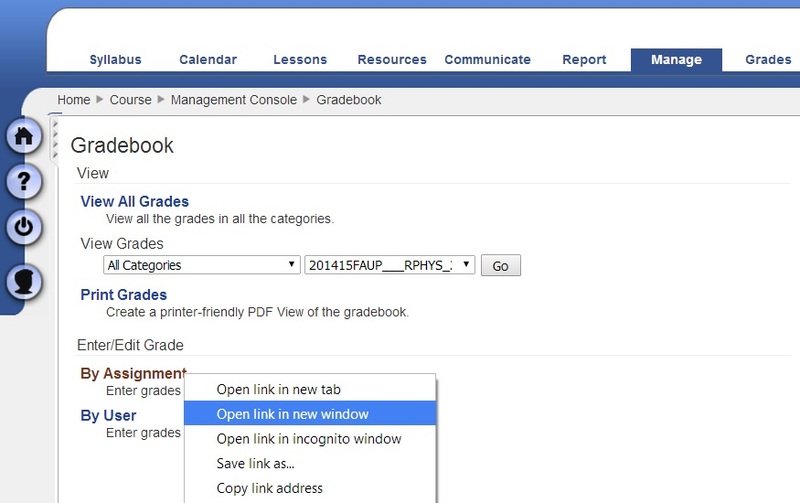 Don’t be surprised that after you open the gradebook in a new window the angel menu vanishes. This is exactly as it should be. At this stage, we are ready to execute our program. 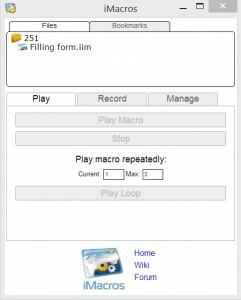 Open iMacros, select the macro Filling form.iim and choose Play macro repeatedly a Max equal to the number of students. Then click Play loop and the grades should be transferred into Angel. Let me stress that all these tips serve a single purpose: to take unnecessary and dull workload from you, so that you can focus on the important part of teaching, providing the best possible learning experience to the students! You might also be interested in how to organize your recitations groups effectively. You need to access an article that is restricted by the publisher to only university members. You are outside of the United States, but need to access a website for which you need to have a US IP address. You want to print at the university from a printer in the physics network, but you are only connected to the general PSU wifi. The Physics Department uses the VPN of the Eberly College of Science starting 2016. It uses the VPN product by GlobalProtect. Detailed instructions are provided on the college webpage here: https://elements.science.psu.edu/it/frequently-asked-how-to-questions/connecting-to-science-vpn (PSU Account login needed). There are better ways to do the setup, here given in the following tips for different platforms. Follow the steps on the college webpage. Download the app by GlobalProtect for Android or iOS. Open the app, grant it VPN permission when prompted, then enter the portal (i.e. gateway) provided in the college webpage together with your PSU credentials. There may be a warning about the certificate of the VPN server. One can simply continue and ignore it. If concerned, see the end of this document. 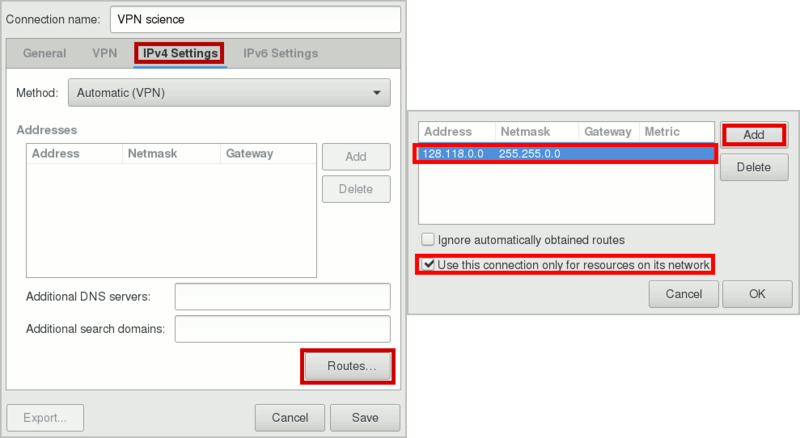 Here is the procedure to connect using NetworkManager, with split-tunneling properly set up. Setup the Science VPN as outlined in the Fedora Docs link given on the college webpage. Refer to the college webpage for VPN type (“Cisco Compatible VPN (vpnc)”), gateway, and user & group credentials. The subnet IP and netmask given above are speculative. It should tunnel your connections to the Eberly College of Science—hence the Physics Department—through VPN Science. Should it not, increase the corresponding IP range. One can check it in the details of the certificate received.